Chris Forsyth is bringing his unstoppable live show to the Entry tonight, having released his first album with the Solar Motel Band, Intensity Ghost, just last month. This isn't Forsyth's first album with this backing group however, as they accompanied him on his previous tour in support of his widely-acclaimed solo release, Solar Motel. The group is known for their psych/art rock, displaying huge creative leaps and developments in the band’s sound as they had a hand in the creation of the newest effort. The group is full of music veterans, including the ex-War on Drugs drummer, Steven Urgo. Music is often compared to other experimental guitar aficionados, such as influential group Television. The live shows are intense, and Chris Forsyth makes sure each audience member gets their money’s worth. Catch Chris and the Solar Motel band tonight, it’ll be worth your while. 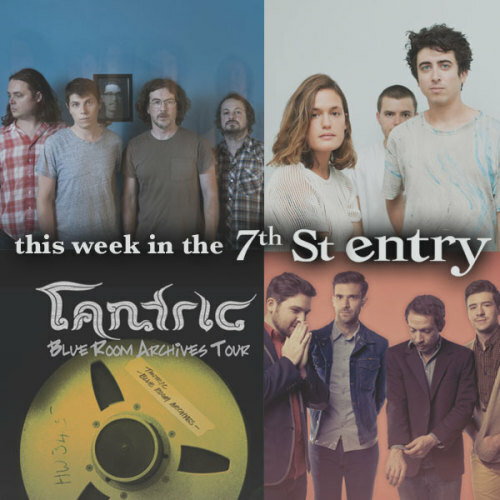 Veteran rockers Tantric will be headlining the Entry Tuesday night, performing behind their Blue Room Archives album that was released this past September. This hard-rock four piece started all the way back in 1998, the “good ‘ol" days of post-grunge bands. They've since had a long career consisting of six studio albums, their most recent having been released this past September. They’re famous for their electric violin live on stage, as well as their heavily distorted guitars and acoustic talent. This will be Tantric's first time performing in the 7th St Entry, so make sure that anyone you know vying for ‘90s rock is at this show, the band is known for their intense live renditions. Mass Nerve is getting together a strong group of local budding talent this Thursday night, featuring sets from Fort Wilson Riot, Tired Tongues, and Aaron & The Sea. Experimental, electronic music fans alike will take pleasure in the sounds of the evening, with all three groups representing Minneapolis talent. Aaron & The Sea can be described as dark, muddy lo-fi ambient electronic with mostly unfiltered vocals, makes for a great companion artist to Sylvan Esso. Fort Wilson riot represent the duo of Jacob Mullis and Amy Hager, an avant-garde pop being produced by 12 Rods frontman Ryan Olcott. DJ MAKR is a frequent Marijuana Deathsquads contributor and a part of Twin Cities bands such as Votel and the newly formed RONiiA. Don’t let the name confuse you Midwesterners, Daniel Ellsworth and his band, The Great Lakes, hail from Nashville-- but don’t let that trick you, as they are known for their undeniable synths and very respectable rock and roll sound. Their self-released debut album took the internet by storm, earning them a top album mention from many publications. The music community took notice, and for their sophomore release they worked with a former Jack White producer to refine their dance pop, indie rock sound in the studio, churning out one of Esquire’s favorite albums of the year, as well as wooing audiences nationwide with their surprisingly hard-hitting shows, known for sacrificing their bodies completely in the heat of the moment, breaking glasses and eardrums alike. This Friday in the Entry? Check out Daniel Ellsworth and his crew, you are sure to be impressed. The local Ed Gein Fan Club bills themselves as Minnesota's only true punk-rock band - so self-described punks should take note. They’ll be headlining the Entry this Saturday night in what are referred to as some of “the most extreme” of shows that can be hosted in the beloved 7th St. This band has been around since 1985, touring around the Twin Cities handing out demo tapes left and right, slowly converting from a (real) garage band to an actual band, having their name christened by having it on a t-shirt, and someone asking if that was the band name. Their first gig in the Entry was in January of 1991, long before many of your favorite First Ave shows. Come join these Minneapolis rock veterans at their 30th anniversary this Saturday night for some head bangin’. Beginning as a new-age bedroom project, with different recordings being shared via email as .zip files, WET, the NY synth-pop group has taken the music scene by storm, with their self-titled EP having been released in 2013. The group draws comparisons from Sylvan Esso, a Minneapolis favorite, and has no problem throwing ocean-y synths over Kelly Zutrau’s lovely voice. Wet crosses between indie electronic and dream pop, not afraid to put the listener into a huge hangar-sized soundscape with minimalistic acoustic guitars and reverb throughout. Check them out Sunday night in the Entry, with hyped local opener Votel.